Apocalypse is out – What are the changes? Apocalypse Book officially hit the shelves today. Based on eye witness accounts what are the changes? This hasn’t really changed. The games is still time based, rather than turn based. There is now a suggestion that 12 hours is allocated to a 1 day game. With an hour being allocated to deployment and set up, an hour being allocated to lunch and 30 minutes being allocated to dinner. My gaming group would normally aim to aim to end before a late dinner. The obvious implication is that the more points you play, the less turns you get. There are now 6 deployment methods. This will be a welcome change for my gaming group. There are the obvious ways of playing across the board. There are variations on the size on no man’s land and some semi circle based deployments known as crossroads. 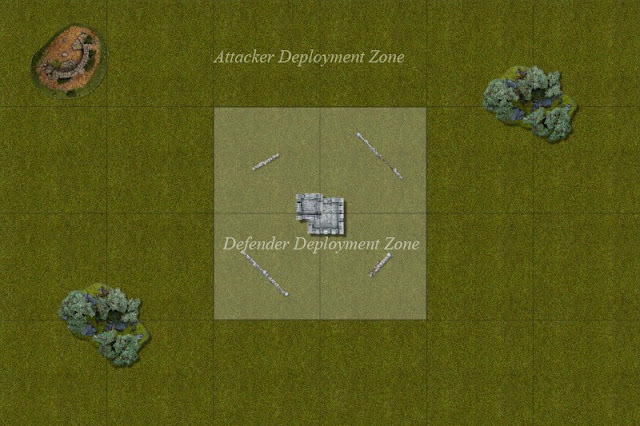 In this method each army has 3 deployment zones around the board adjacent to the enemies deployment. This simulates a number of small battle forming a larger game, similar, but not the same as a linked game. These are similar to assets but are specific to armies. They are used at a time of the players choosing. 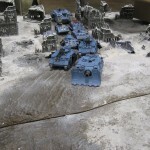 Imperial players have an effect called “For the Emperor” which provides fearless and furious charge. Chaos get re-rolls to hit and wound on 1s, Orks get a stomp attack. Dark Eldar Hatred and rage, Tau, Stubbon, Feel no pain (4+) and Counter attach. Tyranids get Preferred enemy and run and shoot in the same turn. Necrons get assimilation will, fearless and reanimation (4+)! 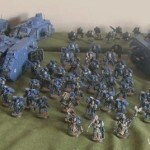 Space Marines and Chaos Space Marines can use their Primarch rule in place of the standard Imperial Divine Intervention. This only impacts the Warlord, although some impact those within 12″ of the warlord. The Ultramarine’s gives split fire, tank hunters, preferred enemy, stealth, fearless and relentless to all those with 12″ of the warlord. 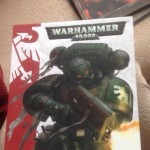 The Blood Angel Warlord can change in to a flying monstrous creature! These are events that occur at a time decided by the GM or are random checked for at the start of turns. The one shown in white dwarf destroyed everything on a 24 x 24 inch area of the game table. These are of course optional for those who don’t like randomness messing up their carefully planed gamed of 40k. There are now 6 missions. Three standard missions and 3 extra in the Armageddon campaign. I will add at this point that the deployment method is not random. Each mission has a predetermined deployment map. The standard missions are a meet grinder, surrounded and spearhead based mission. This section makes up about 45% of the book. Many of the formations are basically the same. 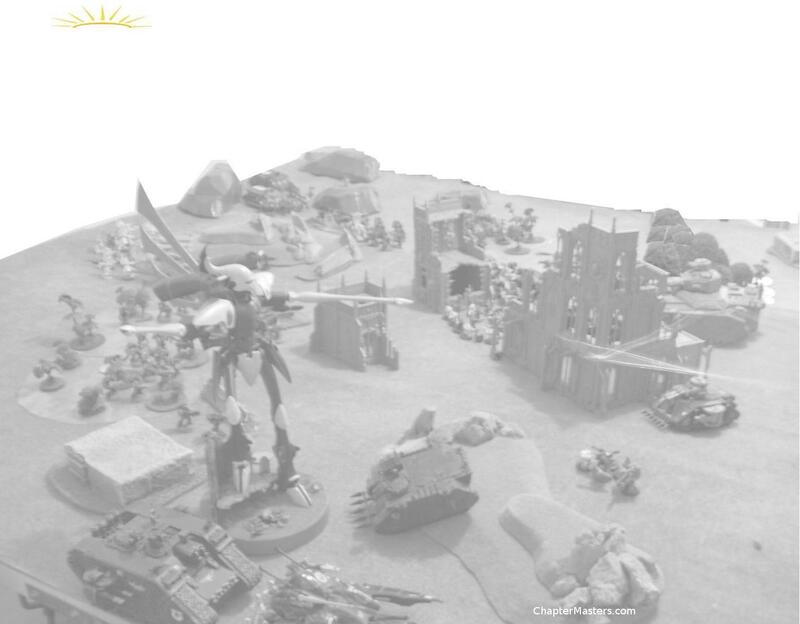 GW have used pictures of models on most of the formation pages as examples. The original book had drawings. Some of the formations have had little tweaks. The Space Marine Battle company now has rhinos as optional but has 3xdreadnoughts included. The formations are now free and the assets have been changed or at least the effects of the assets have been. Players may receive free formations well. Fielding a space marine company but not taking the asset did feel a bit weird in the last version of the game. As you might expect there has been a major overhauls. Most of the original assets are still there, Vortex Grenade, Camouflage, Flank march (can only be used by a single formation), Mine field, Orbital Strike, Shield Generator, Replacements which I think was called something else before (brings a formation back). Strategic Redeployment is gone. Structure points are gone. Hull points have been listed against each super heavy. Those that aren’t in the book are assume to have 3 hull points for each structure point. Penetrating and glancing hits have the same impact on super heavies but 6s on the damage table cause an extra D3 hull points to be lost. Fort Pain at Warhammer World – A word of warning – read this before you play. 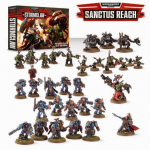 Should You Buy 40k 7th Edition?